Shin Jinseo 3p defeated Kim Myounghun 2p, posting a 2-1 record to win the 2015 Let’s Run Park Cup final on December 22, becoming a new teen champion in Korea. 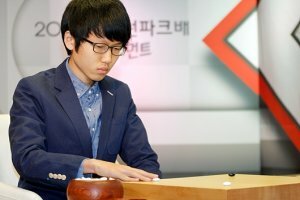 The final featured a battle between two teenagers, the first time such young players had competed since 2003, in the Chunwon (Korean Tengen) final between Choi Cheolhan 9p and Won Seongjin 9p. - excerpted from Younggil An’s report on Go Game Guru, which includes game records of all three games plus more photos. This week we’re presenting extended coverage of the Korean World Amateur Championships (KPMC; click here for our winner’s report on December 8 and here for Eric Lui on Camaraderie and Pure Joy). Here’s Keith Arnold’s interview with Lui, which took place at last Sunday’s meeting of the Baltimore Go Club. 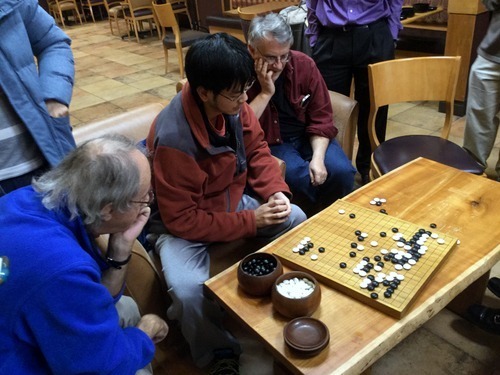 The longtime local organizer has known Lui since he first began playing go. photo: Lui reviewing his Round 5 KPMC game with Hong Kong (watch for the review in tomorrow’s EJ); photo by Keith Arnold. KA: First of all, Congratulations on the achievement (5-1; played for championship in final round); were you happy with your play overall? EL: Thank you. There were some good moments in my games, and I played about as well as I expected to, so on the whole I’m not dissatisfied. KA: Can you give us a brief description of the tournament format and venue? EL: The tournament was a 6-round Swiss, with 40 minutes basic time per player and 3 periods of 30 seconds byo yomi. Initially, the players were split into two groups by strength and then paired within the group. The tournament was held at Riverside Hotel in Seoul’s Gangnam district, a seemingly high-class place with fancy, luxurious dining halls, and a long, spacious hall that led to a separate large room for the playing area. KA: You are known as a slow player, but is it possible that your experience in byo yomi helps you in a quicker game like this? EL: I’d prefer to think of others as quick players. There is no room for slow players these days, especially in amateur go where time limits are very short. Speed is key and can be a major weapon. My play in byo yomi is far from ideal, but it seems that my opponents also felt the time pressure. KA: How was the competition? Other than China, who was your toughest opponent? EL: The player from Hong Kong was strong, and I also had a tough game against Ukraine. KA: Do you get a chance to look at some of your opponents games’ to prepare for these events, or do you focus on making sure your own game is sharp? EL: I didn’t know who would be coming, so I just tried to stay in good physical condition. KA: How did you feel going into a championship game? EL: I thought of Ben (Lockhart) last year and wondered if history was going to repeat itself (he went 5-0 before losing to Korea in the final). In fact, scarcely 90 minutes before the game, the Chinese player and I were seated at the same table, having lunch together. It felt a bit odd that we would soon be playing for the championship. KA: In the final game you played mirror go for the first 14 moves, was that an effort to save time, or was it a particular strategy you worked on? EL: I’ve been interested in mirror go for a while, yet I know little about it from limited practical experience. Actually, I think mirror go is a poor strategy for saving time, since you can’t just blindly copy your opponent’s moves. There is so much reading and strategic planning involved. KA: Being 5-0 and dropping to 4th seems harsh; can you explain what hurt your SOS? EL: It’s fair. This year, the Chinese and Korean players were a class above everyone else, although the young kid from Taiwan had very good chances to win against the Chinese player. My first two rounds were against Serbia and Slovakia, and they both ended up with (only) two wins. Those are the breaks, and there’s nothing to do about it. KA: How does this compare to your 3rd place in the World Amateur Go Championships? EL: Finishing third in the WAGC is by far my best achievement, yet my KPMC result is no less satisfying. KA: You have really done well representing the U.S. Go is such a personal game; does representing your country put additional pressure on you, or is your internal competitive will all the motivation you need? EL: My major goal for this tournament was to have a good time. In the U.S., we are always fighting for prizes, rating points, etc. and the stakes are much higher. Here, I just felt content to play games face-to-face. I wasn’t too concerned about my results. KA: What do you feel are the strengths of your game right now? What are you most trying to work on? EL: I feel confident in games with lots of direct fighting. The opening is probably my weakest part, so I’m concentrating on improving it by studying pro games. KA: We have played together since you first began playing and I often brag that I taught you everything you know. Can you think of anything you actually learned from me? EL: That it’s always possible to win against stronger players. KA: Aside from winning games, what was your favorite part of the trip? EL: Meeting the other players and organizers was by far the best part. Winning games was just a bonus. Tomorrow: Eric Lui’s commentary on his KPMC Round 5 game with Hong Kong. This week we’ll present extended coverage of the Korean World Amateur Championships (KPMC; click here for our winner’s report on December 8). Below you’ll find U.S. rep Eric Lui’s delightful reminiscence of the event, where he went undefeated for five rounds, losing only to champion China in the final (Ben Lockhart did the same thing last year, except his final round loss was to Korea). Tomorrow we will have a Q&A with Eric about the event, and finally we will present a brief review of his 5th round game against Hong Kong. It’s been nine years since I participated in the first Korea Prime Minister’s Cup. My memories of the occasion as a whole are dim at best, but I can still recall a few fragments of the extravagant outdoor opening ceremony, and the completely bonkers closing ceremony that had players and local Korean folk holding hands and running in circles around the plaza square into the night. Turn the clock forward and it’s time for the 10th Korea Prime Minister’s Cup, held in Seoul’s Gangnam district. While the first KPMC was lavish in style and grand in execution, the 10th edition thrived on the strength of its organizers, a charismatic and multilingual group who couldn’t have been more welcoming. The genuine camaraderie among the players and organizers produced a truly festive atmosphere. The standout performer this time was Cristian Pop of Romania, who, in a first-round heavyweight clash, defeated Japan’s Dr. Shinichiro Osawa, a neurosurgeon and former teacher of the star player Ichiriki Ryo 7p. Pop would go on to finish 3rd. My last-round defeat at the hands of China’s top-rated amateur Hu Yuqing, the tournament winner, landed me in 4th place on SOS. Hu has terrorized the amateur go world for well over a decade, and, playing in his 6th (!) KPMC at the raw age of 34, shows no signs of slowing down. The closing ceremony was well-attended with VIPs such as Seo Bongsoo 9p, chief referee, Kim Seungjun 9p, Lee Hajin 3p, secretary of IGF, and Martin Stiassny, president of EGF. The highlights featured a male performer, clad in headgear with a long wavy band attached to the brim, executing aerial cartwheels around a circle in a breathtaking display of athleticism and artistry, and a moving interpretation of Secret Garden’s iconic “Song from a Secret Garden” by a quartet on traditional Korean instruments including a vertical fiddle, a bamboo flute, and a long zither. The next day was the traditional sightseeing day and the first snow of the season. Later that night, while walking in downtown Myeongdong, Seoul’s premier shopping district, clutching bags filled with cosmetics and various beauty products, it crossed my mind that in less than half a day, I would be on my way to the airport and this trip would become just a memory. When we reached the end of the street, I looked back, shivering slightly in the freezing cold, and took it all in: the bright lights, buildings that seemed to touch the sky, hustle and bustle in a world I didn’t understand, and felt strangely at ease. In that moment, I saw myself four days ago, sleep-deprived and slightly haggard upon arrival. I recalled the interesting conversations, laughter, and failed attempts at procuring more food. I thought of the first time I participated in this tournament, so eager and determined to prove something. I felt pure joy at having had the opportunity to play in this tournament again, and a twinge of regret about all the pictures I had forgotten to take, yet I took solace knowing that others would not have done the same. I remembered standing on an outdoor patio at Tokyo Narita Airport, watching from a distance as a plane barreled down the runway and took off into the sky, my hopes and dreams soaring with it, and I smiled inwardly as I realized how much there was to look forward to. And then the moment was gone. I heard a voice, and a sudden gust of wind brought me back to earth. Following a few steps behind a small crowd into a donut shop, I rubbed my hands together in anticipation of warmth. Tomorrow: a Q&A with Eric about the 2015 KPMC. 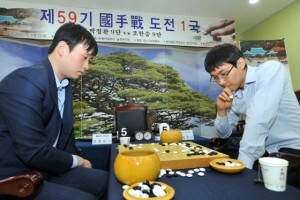 Park Jeonghwan Defeats Cho Hanseung in Kuksu: The finalists in the 59th Kuksu — Park Jeonghwan and Cho Hanseung — are the same as last year and defending champion Park is looking to repeat the previous result as well. Park, playing White, forced Cho to resign after 178 moves. “Black had a lot of territory in the beginning, so it didn’t look good,” Park said in an interview, “but after the middle game White’s territory increased significantly, and I was fine.” The second round in the best-of-three match will be next year in January. Gyeongbuk Wins Samdasu Amateur City League Cup: The question of which city is the strongest in all of South Korea was decided on December 9th when the two finalist cities, Cheonnam and Gyeongbok, faced off in their final match in Jeju, South Korea. Kyeongbok defeated Kyeongnam on the 20th of November in the Baduk TV studios in Seoul to join Cheonnam in the finals. The tournament began with 12 different teams from different cities/regions in South Korea. Each team has four members who all face off; each team earns points by winning, and whichever team has more points by the end wins. This way, the teams play out all four games, even if the first three people lose, the result of the last game can decide the whole match. The Gyeongbuk team was comprised of Park Gangsu, Song Yesul, Park Yeongjin, Yi Cheolju and Park Seonggyun. 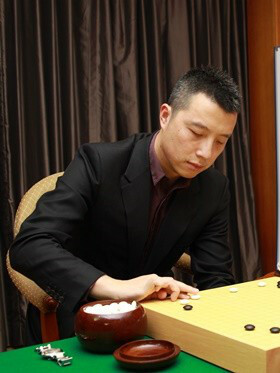 China’s Yuqing Hu won the 10th Korean Prime Minister’s Cup (KPMC), held November 22-27 in Seoul. Hu (left) topped a field of 55 countries. Heesu Kim (right) of Korea was second, Christian Pop of Romania took third place, Eric Lui of the U.S. took 4th place with a 5-1 record, and Shinichiro Osawa of Japan was fifth. 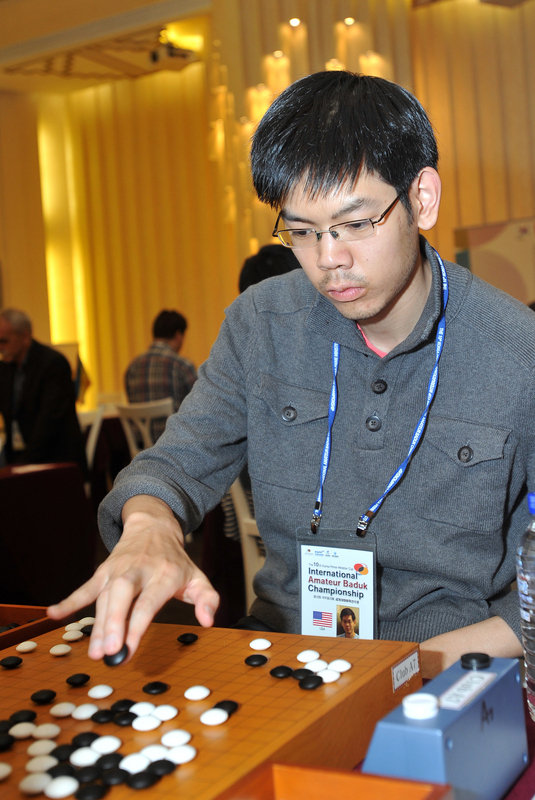 At 5-0, Lui played for the championship in round 6 against China with both players undefeated, the first time an American has played in the deciding game of an international tournament. This is the second time a Chinese player has won the KPMC; Korea has won seven times and Taiwan has won once. Complete results can be downloaded from the European Go Federation’s report. Choi Cheolhan 9P, the third player from Team Korea, defeated China’s Wu Guangya 6P (who stopped Ichiriki Ryo’s winning streak at the end of Round 1) and Japan’s Ida Atsushi 8P to get the second round of the Nongshim Cup underway November 27 to December 1 in Busan, Korea. Then Choi ran into Gu Li 9P (Team China), who took an early lead and never let go. Gu then beat Japan’s Kono Rin 9P and Korea’s Park Junghwan 9P to extend his winning streak to three. The final round will be played in Shanghai, China, where play resumes on March 1, 2016. Thanks to Gu Li’s dominating performance during this round, China still has three players – Gu Li 9P, Lian Xiao 7P and Ke Jie 9P, while Japan has two, Murakawa Daisuke 8P and Iyama Yuta 9P and Lee Sedol is the last man standing for Korea. - Adapted from a report on Go Game Guru which includes game records and more photos. Lee Sedol 9P (right) defeated Ahn Seongjun 6P and Ke Jie 9P (left) beat Park Younghun 9P in the semifinals of the second MLily Cup, played November 22-25 in Hefei, China. The Ke Jie-Park Younghun showdown — relayed live on the AGA’s YouTube channel with commentary by Myungwan Kim 9P — was one of the most interesting matches of the year. 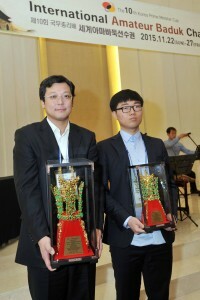 Ke Jie is ranked #1 in China, is virtually undefeated as White in 2015 and proceeded to the final of the 2015 Samsung Cup in early November by defeating Lee Sedol. Meanwhile, Park Younghun is in his second heyday in 2015. He’s ranked #3 in Korea, and he proceeded to the final of 20th LG Cup by defeating Tuo Jiaxi 9p about only a week ago. Lee Sedol is currently ranked #2 in Korea, and Ahn Seongjun is ranked #7. Click here for more analysis, photos, game records and game commentary by Younggil An 8P on Go Game Guru. Update (12/24): Ke is not, as originally reported, undefeated this year on white; in fact he has lost twice. 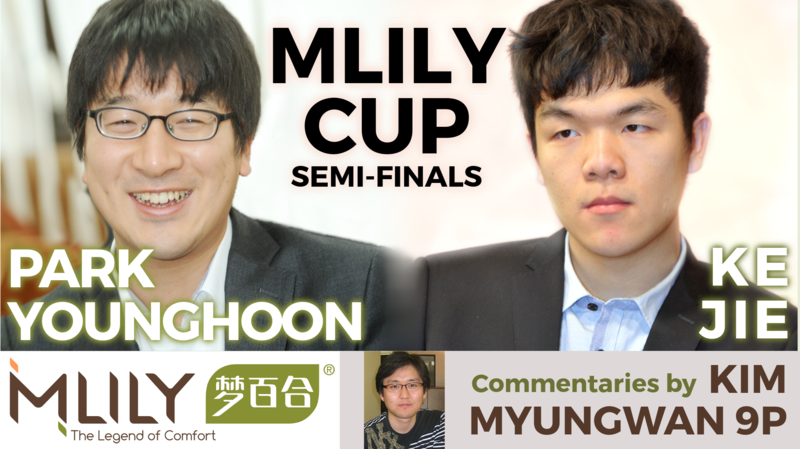 Ke Jie 9P lost Game 2 of the MLily Cup semifinal against Park Younghoon 9P Monday night, setting up a decisive Game 3 showdown that will be broadcast Tuesday night. Myungwan Kim 9P will provide live English commentary on the AGA’s Youtube Channel starting at 7P PST (10P EST). Ke Jie 9p beat Lee Sedol 9p by resignation, a second win in two days to win the 2015 Samsung Cup semifinal. The much anticipated contest between the young Chinese star, #2 in the world, and Korean great Lee, secures for Ke a spot in the Samsung final match with its prize of approximately $300,000 first prize. The match was the subject of a live streaming commentary Tuesday night by Myungwan Kim 9p. 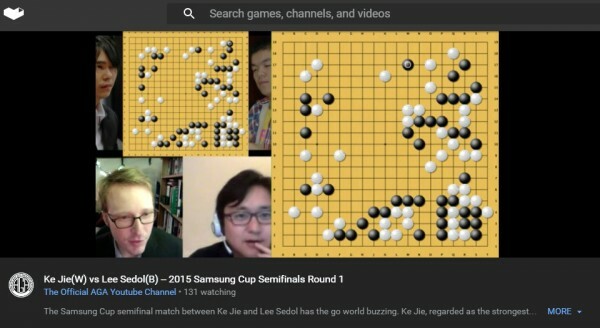 Kim’s in-depth analysis of the game, anchored by E-Journal broadcaster Andrew Jackson 4d, was followed by nearly 150 players on the AGA’s YouTube channel despite extending beyond midnight on the East Coast. “I love the sound the commentary makes as it sails way over my head,” said Cement12293. “We’re living in the future: live pro go commentary in English!” said joby morey. The game was also broadcast on KGS. In addition to Myungwan Kim in Los Angeles and Andrew Jackson in Seattle, the AGA’s E-Journal broadcast team included Dennis Wheeler (also in Seattle) and Steve Colburn in Rochester, New York. Xiaocheng Hu did the graphics for the video stream. Myungwan Kim 9p will provide live streaming commentary again Tuesday night for the second round in the Samsung Cup semifinal match between Ke Jie and Lee Sedol. Along with E-Journal broadcaster Andrew Jackson, Kim commented Game 1 on Monday night, attracting an engaged and enthusiastic online audience. Tuesday night’s stream will be on the AGA’s official YouTube channel and official Twitch channel, as well as on KGS, beginning at 7:30PM PST (10:30p EST).